If you collect Star Wars Black Series figures and want a more awesome way to display them, or even take pictures of them if you’re like me, then you need to take a look at the latest diroama/playset creation from Dagobah Customs. 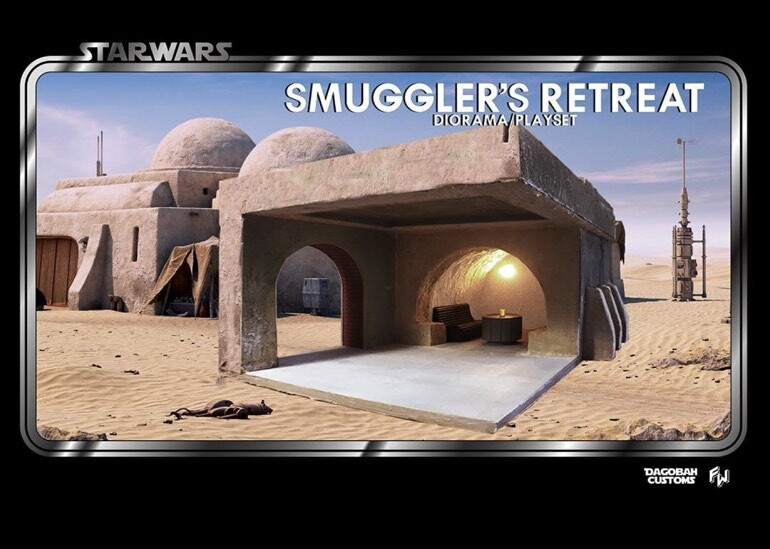 His latest build is called the Smuggler’s Retreat, and once you take it in you can see that he has essentially recreated a Mos Eisley structure in 1:12 scale. Its inside can be used to recreate scenes from A New Hope, while its exteriors can be used for other Star Wars inspired backgrounds. If you opt for the deluxe version you can stage some great looking setups in the doorway, or use the expanded space to create even grander looking scenes. This bad boy comes in two versions and is currently up for pre-order through IG. The standard version doesn’t include the archway, but both versions will include a custom bend, table, and light. Dimensions and additional details for the Deluxe version can be found below. You can also check out a few additional shots of the product after the break. Can be made modular (magnetized) or 1 single unit. *Picture is 1 single unit. Arch can be painted in any color scheme desired. If not specified then will be red.